Kia hasn't drastically updated the Optima for the 2019 model year, but clearly the Korean brand was proud of this new model because it flew us out to the factory where the car is built in West Point, Georgia to drive it. 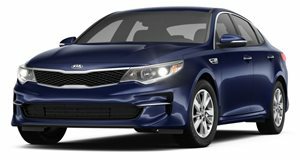 The Korean automaker is calling the 2019 Optima a mid-cycle refresh, so the car doesn't differ greatly from the 2016 SXL model we loved back in 2016. The changes are more than just skin deep though, as Kia tries to remain competitive in the midsize sedan class - one of the most crowded segments in the automotive industry. 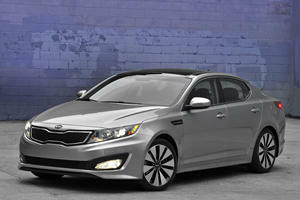 It would seem Kia is fighting an uphill battle against the recently redesigned Honda Accord and Toyota Camry. We've driven both, and we can confidently say that Kia has a few tricks up its sleeve to stay competitive. For starters, Kia has historically bested its Japanese rivals on price, though full pricing information is not yet available for the 2019 Optima to confirm this for sure. The Optima will be available in four trim levels: LX, S, EX, and SX. Those first two trims are powered by the base 2.4-liter four-cylinder engine producing 185 hp and 178 lb-ft of torque going out to the front wheels through a six-speed automatic transmission. The EX trim receives a smaller 1.6-liter turbo four-cylinder producing 178 hp and 195 lb-ft of torque going to a seven-speed dual-clutch transmission. 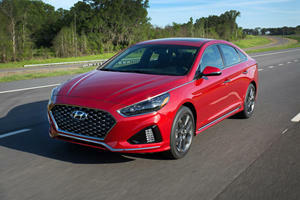 We drove the top-trim SX, which is powered by a 2.0-liter turbo four-cylinder producing 245 hp and 260 lb-ft of torque. The SX trim also brings in sport tuned suspension, paddle shifters, 18-inch alloy wheels, LED headlights with auto leveling, red brake calipers, a black rear spoiler, panoramic sunroof, turbo badges, a 4.3-inch color trip computer, black leather seats with red stitching, 12-way power seats with four-way lumbar, two-position memory seats, ventilated seats, heated steering wheel, Harman Kardon 10-speaker audio, and more. The 2018 Optima SX starts at $30,600, which puts it dangerously close to the Stinger's starting price of $31,900. Ultimately, the decision comes down to whether you value RWD and a larger trunk, or more features and a better deal on the purchase price. Many people have come to us asking whether they should buy a fully-loaded Optima or a base Stinger, and the decision isn't as easy as we thought. The base Stinger has more power from its 2.0-liter turbo four-cylinder (255 hp), but lacks almost all of the luxury features found in the Optima SX. Buyers will also likely be able to get a better deal on the Optima, increasing the gap between the two cars. The Stinger is a great car for enthusiasts, but the Optima caters to a much wider market. Kia's greatest weapon in the war against the Camry and Accord is the Optima's standard suite of safety features across all trim levels. Every Optima comes standard with blind-spot warning, park distance warning, forward collision warning, forward collision avoidance assist, lane change assist, lane keep assist, and lane departure warning. Our loaded SX trim even added adaptive cruise control, which made the Optima even easier to drive. All of these systems combine to make the Optima one of the safest cars in the class, which should be a huge selling point. Most of the Optima's competitors charge extra for features like blind spot monitoring and lane keep assist, or make you buy a higher trim level. Kia's "on the house" approach to safety should win favor in this competitive segment. 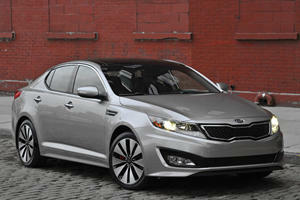 In terms of driving, the Optima should win even more brownie points with buyers. We only sampled the 2.0-liter SX trim and found it to be a highly competent mid-size sedan. The steering feel is not on the level of the Mazda 6, but feels in line with the latest Camry. We came into our drive thinking the Optima would suffer with its dated six-speed transmission, since the Camry and Accord have moved on to eight and 10 speeds respectively. To our delight, the six-speed automatic ended up being a joy, shifting eagerly when on the throttle and smoothly during relaxed driving. Likewise, we thought the 245-hp engine would feel slow compared to competitors like the Camry, which now produces 301 hp from its V6 engine. Thanks to the quick downshifts from the six-speed transmission and the punchy 260 lb-ft of torque, the Optima never felt slow from behind the wheel. Kia has somehow managed to implant a bit of Stinger DNA into the Optima, making it a perfectly enjoyable car to toss around on a back road. The car has four drive modes: normal, eco, sport, and smart. Changing between the modes doesn't create a sizable difference, but we noticed slightly quicker upshifts in sport mode and marginally heavier steering. Smart mode continues to be an interesting feature on Kia models - it switches between sport and normal modes depending on how you drive in real time, keeping the car always suited for the occasion. On the inside, the Kia Optima falls short of being our favorite interior in the category. The Honda Accord and Mazda 6 still feel more upscale, but the Optima easily matches if not beats the Toyota Camry on material feel. The interior is very well laid out, and Apple Car Play and Android Auto are standard to help make the infotainment experience as easy as possible. Our lone complaint is a slightly tight 35.6 inches of rear leg room, which is less than most of the cars in this class. We'll have to wait for final pricing, but the 2019 Optima will likely be a value in its segment with some of the best standard safety tech available and we would have no trouble recommending it.